Several people have been asking about organizing another #SaveTheCloneWars twitter protest. The first one organized by Star Wars Underworld had a good turn out on Saturday at 12:30 pm EST (9:30 am PST). A few days ago, we had a good response on Facebook to the suggestion of a weekly protest on Saturdays at the same time, 12:30 pm EST/9:30 am PST. So, we are moving forward with this plan and ask you to spread the word! 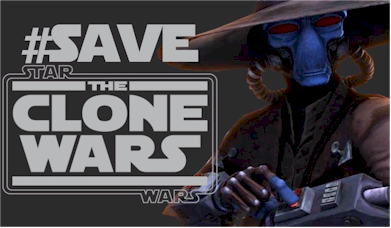 The #SaveTheCloneWars twitter protest is aimed at getting the attention of Disney and LucasFilm, and if possible to get #SaveTheCloneWars to trend on twitter. Hopefully, the protest will also raise awareness of other Star Wars that may be unaware of the cancellation of The Clone Wars or perhaps unmotivated to raise their voices about the series that millions of fans have watched for the past five seasons. Need some extra motivation to get involved withe campaign. There is a great interview with Kyle Newman, director of Fan Boys, on the latest Out of the Blue podcast, at GeekNation.com. Newman had some very passionate words to Star War fans and how they need to express to Disney how they feel about the show they loved getting cancelled. ...You need to tell Disney that they're not just gonna have their way with something that you've kept alive for 35 years! That's the symbolic thing. That's all I'm saying so if you're out there listening, wake up! Stop worrying about your color forms and worry about that they just took George Lucas' story off the air. Wake up and go write a letter!" Check out the full interview at Out of the Blue: Ep. 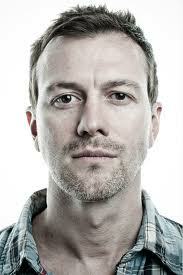 7: Kyle Newman. Send your letters to Disney and LucasFilm. Tweet to @Disney, @StarWars, @TheCloneWars and use the hashtag #SaveTheCloneWars!